Here’s the scene: My girls run into some good friends of theirs, and there’s a big happy celebration. 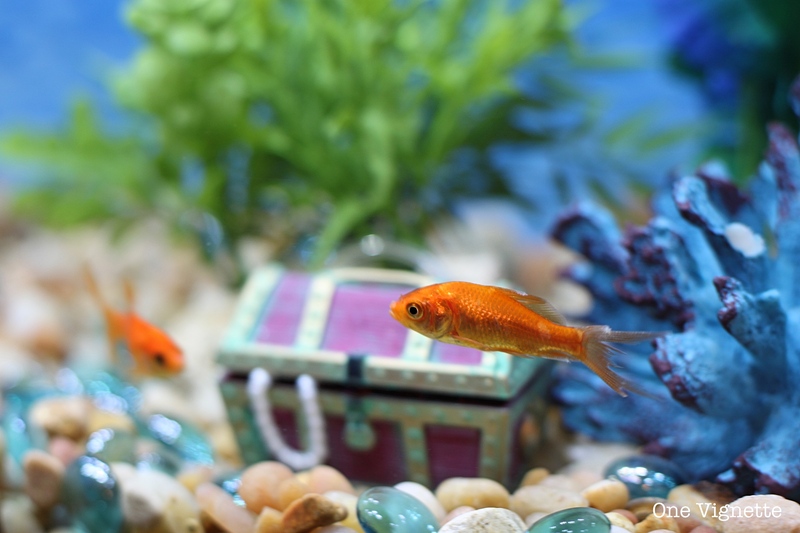 They ask to play the game with a goldfish as a prize. 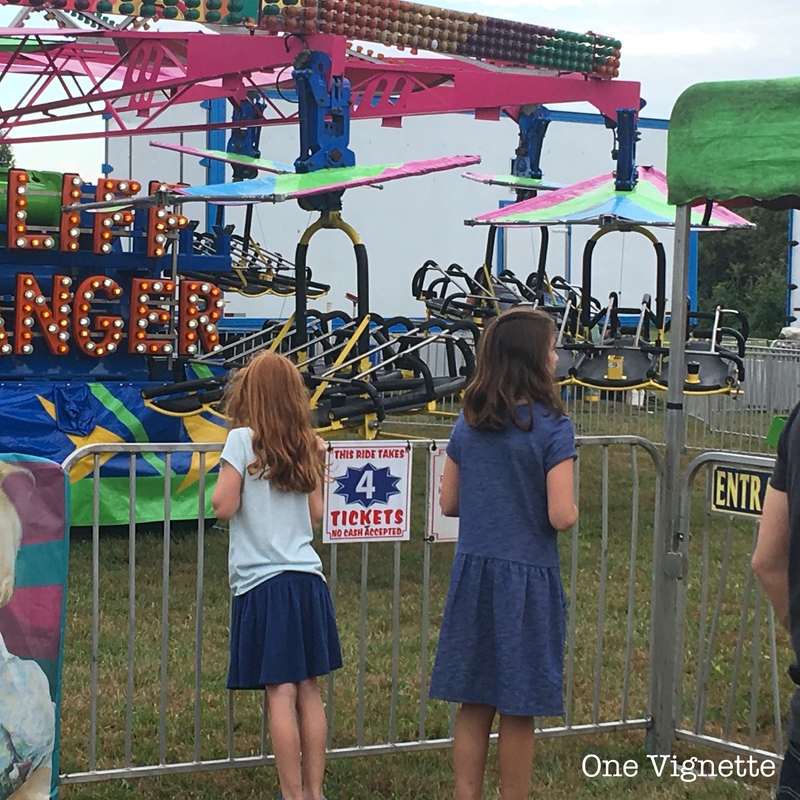 Now, David is off with Cian, chaperoning as he rides a kiddie ride, thereby leaving me unchaperoned around tiny little homeless animals (fish count as animals, right?). The girls only have to ask once before I’m forking over the five bucks for the family-sized bucket of ping-pong balls, and by the time David returns with Cian to discover his calm little world upended, Quinlan and her friend have both won a fish. The friend asks her dad if they can keep the fish, and because he’s a responsible adult, he says no. That leaves us, the irresponsible ones, with one adopted fish and one foster fish. I am SUPER excited. David is not. The kids name them Gilbert and Rey. 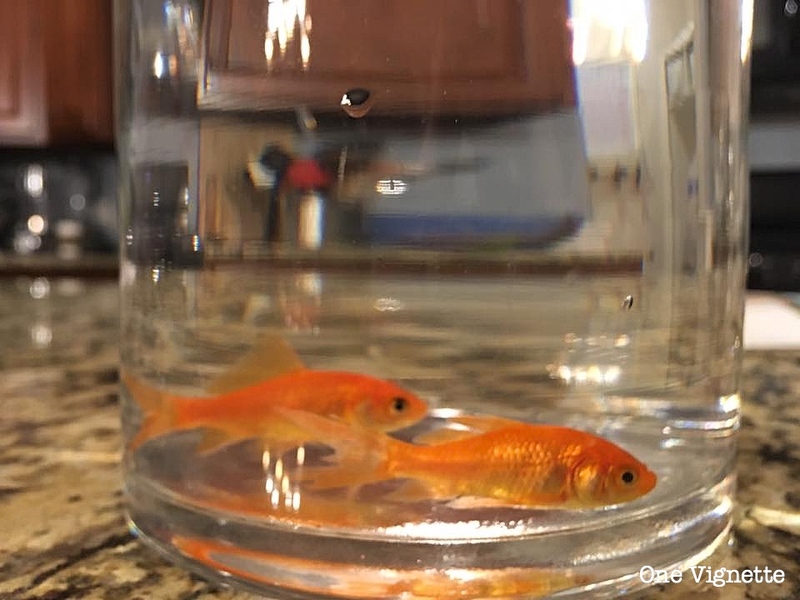 Goldfish’ outsides will grow to the size of their containers, then stop. The problem? Their insides KEEP GROWING. Like mutant alien forms that want to try to take over our species but can’t because their insides keep imploding, goldfish kept in too-small containers will die as soon as their spines begin to crumble and insides expand far beyond what their outsides can hold. Super fun for them. 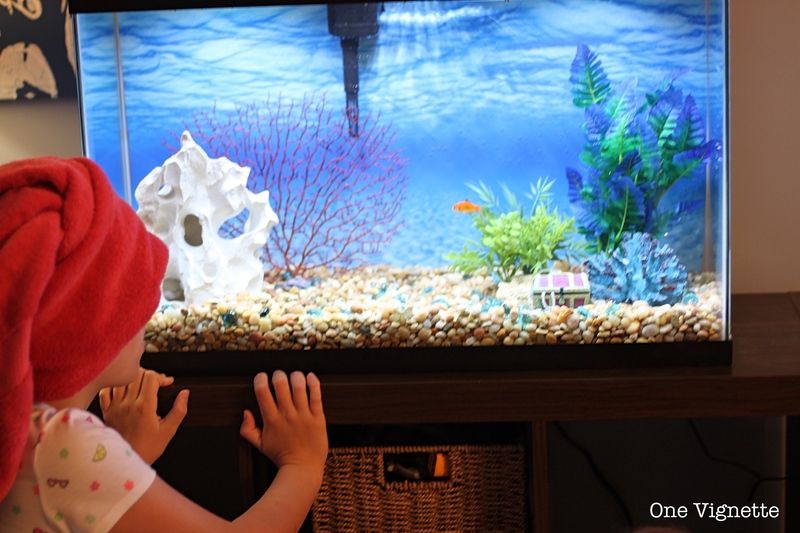 One expert recommended a 40-gallon tank for our two tiny fish until we’re able to build an outdoor four-feet-deep pond so they can grow happily, live 30 years and contentedly overwinter in our backyard. 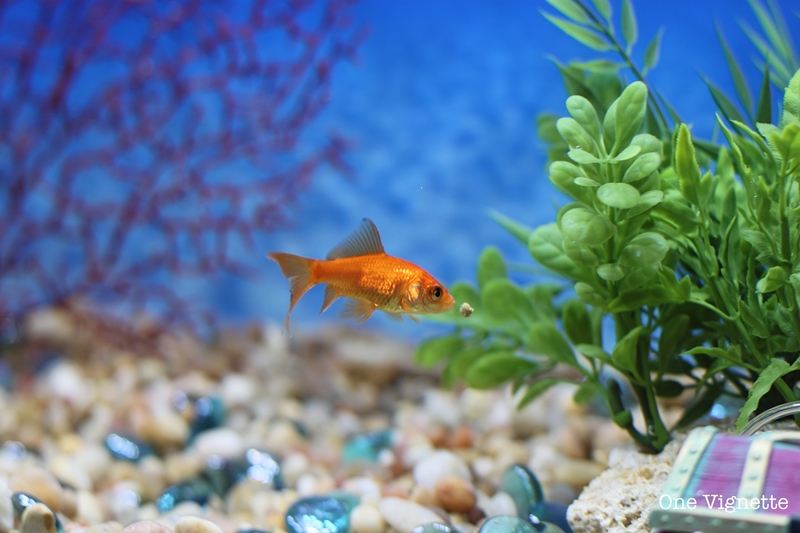 Their digestive systems are awful and their poo is toxic to other fish, so once you have a goldfish, only goldfish shall you keep. Apparently we’re now installing a goldfish pond in our backyard. So what we have now: Two new pets in the family. Gilbert (so named by our girls’ friend Lily, who may or may not be happy that he’s now living not in her nice house but in the suburban equivalent of Sea World) and Rey, won by Quinlan, who’s his much tinier companion and definitely showing the signs of a tough guppy life up until now. Gilbert is a show-off who likes to strut around the tank (I’m concerned that it’s a mating call, and we don’t need any Gilbert, Jrs around here). Rey’s got a beat-up dorsal and rear fin, and her right one is so busted she can’t use it at all (think Nemo, but without the IQ). But she’s hanging in there, and I have a soft spot for her and her tiny damaged fins. As for that easy-peasy little tank I set out to buy? Let’s just say it’s not the cute kitchen countertop one I’d imagined. Because my bleeding heart extends to tiny potentially imploding goldfish, we are now in possession of this: a gigantic tank that dominates our entire family room like an energy-sucking, murmuring monster that will slowly drive us insane and/or to the poverty line, whichever comes first. But we refuse to have any skeleton-crushed imploding vertebrates on our watch, so there you go. We still haven’t painted our kitchen cabinets or replaced the microwave that went up in that little fire we had months ago, but never mind that. We got FISH! 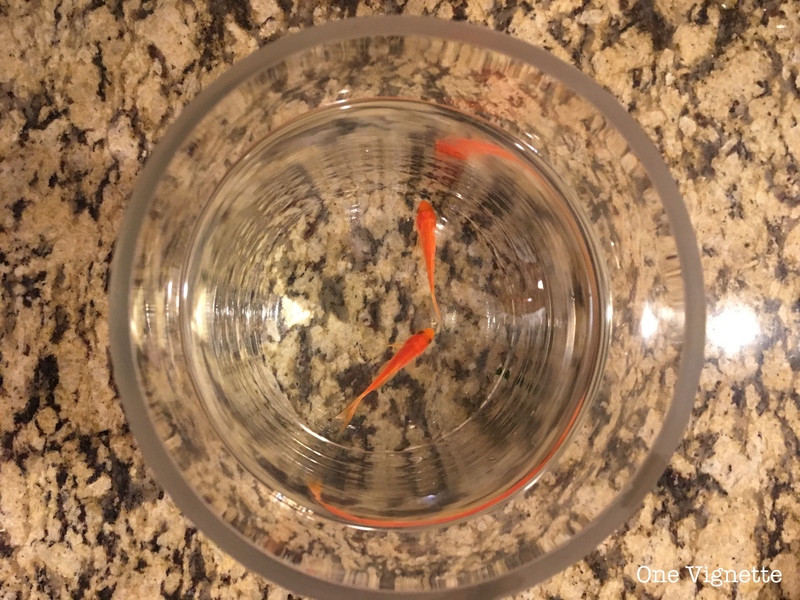 The moral of the story: Our five-dollar goldfish ended up costing us $275, and that’s only because I hustled a 25-percent discount on the tank. This may or may not be the first time David is learning of this, so that should be fun. 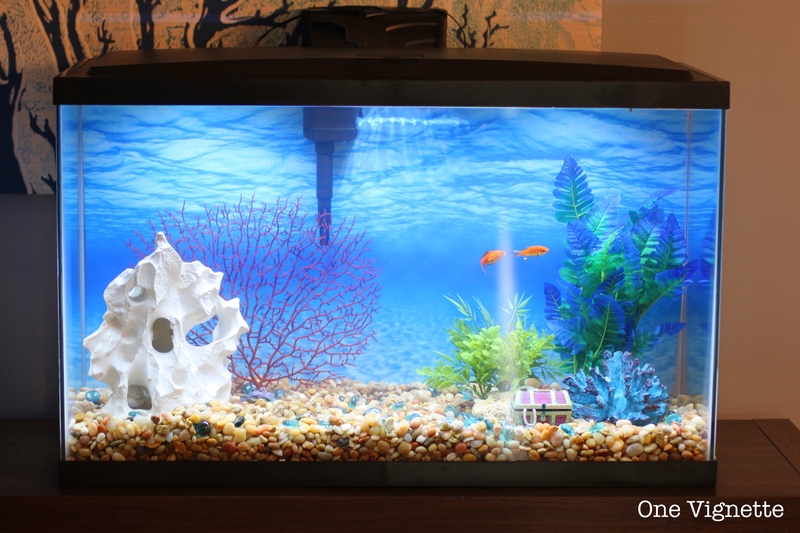 The tank is enormous, fish food stinks, and I’m terrified of waking in the middle of the night to hear the tank crashing through the bookcase that holds it and spilling thirty gallons of poopy fish water and tiny fishy insides all over our first floor carpet. “Can I tell you a secret?” he asked the kids afterward. He was grinning. 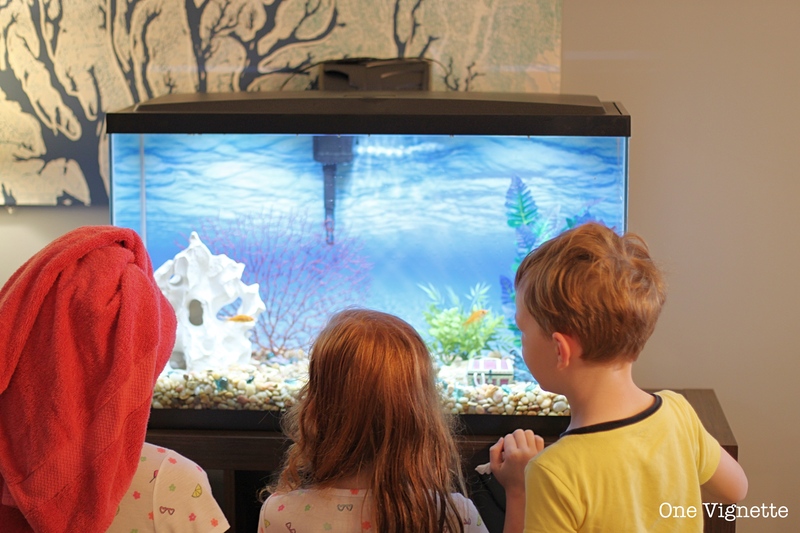 “I always wanted to keep fish.” Together, our family of five gathered ’round the beast of a tank to watch Gilbert circle Rey in a chest-bumping fish dance I’d like to hope was definitely not a mating call. It was a moment. Gilbert and Rey are here to stay, you guys. They’re as adorable and cute as they are dumb, and we all get a kick out of trying to keep them unimploded. I think I made the right move after all. 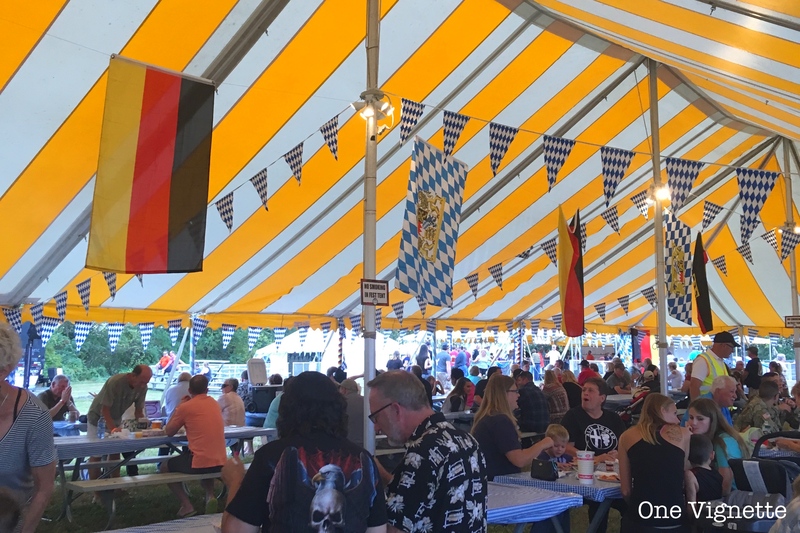 But I’m still not so sure we’ll be attending another Oktoberfest anytime soon. I’m so glad you have given them such a good home, most posts I see about goldfish is them being kept in bowls, thank you for looking after them! !